Mysteries are everywhere. I accept that some of them are hidden under the plastic covers of my 5-year-old MacBook. As computers go, this one, like its owner, is a little long in the tooth but still functional. With 1 GB of RAM and an anemic 120 GB hard drive, it was to technology what Woody Allen is to romance, a wistful artifact. In the last week or so I decided I would turn this geriatric computer into a spunky teenager again. A quick trip to the OWC website and a week later I had 4GB of RAM installed, a chore that took about five minutes, and a 750 GB hard drive upgrade that took longer than five minutes and caused more distress than a green corn tamale in the tourist. 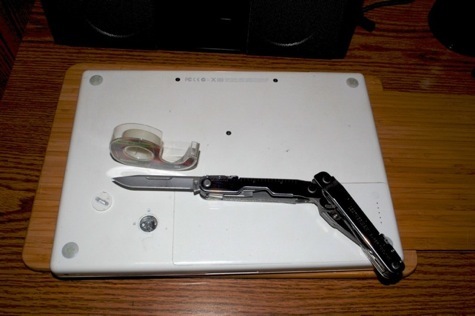 The main source of this distress was not the hard drive but the lock on the back of MacBook that gives the user access to the battery compartment. 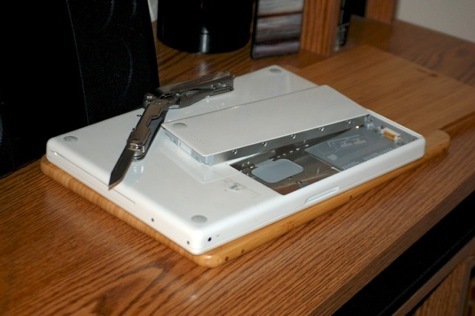 The battery compartment is where we go to add memory or change a MacBook’s hard drive. Typically it’s easier to do both these tasks on a MacBook than it is to sing the chorus to “Loch Lomond” in a wrinkled kilt. The lock on my vintage MacBook is under a slotted plastic disk about the size of a thumbnail. I put a nickel in the slot and turned it to the position with the open lock. That worked well. I was able to lift off the cover of the battery compartment, remove the three screws that hold an L-shaped metal strip that lines the memory slots and hard drive bay, grab the tab attached to the hard drive, and slide it out for all of Tucson to see. Next, I removed the four torx screws that attach the hard drive to its tray (or enclosure), removed the 120 GB drive and replaced it with the 750GB drive. I slid the drive back into the slot and it felt right, or so I thought. I re-attached the metal trim, put the compartment cover back in place, and used my nickel to turn the plastic lock, which suddenly snapped off the metal housing that sits under its belly and activates the lock. There’s a metal slot under the plastic cap and since the cap wouldn’t cooperate, I took a flathead screwdriver and managed to lock the compartment. I turned over the MacBook, plugged in the power supply, cranked it up, and voila, no hard drive. I had booted from a Snow Leopard DVD and launched Disk Utility intending to format the new drive, but DU could not see the new drive. Nada. At that point I was confronted with a useless, non-functioning MacBook and no way to get at its innards to figure out why the hard drive was not being recognized. Since I had just spent about $190 on the 4 gigs of RAM and the hard drive, I was depressed to think I might end up with a fairly expensive doorstop. Worst of all, I couldn’t think of anybody else to blame. Then I remembered that they have “geniuses” at the Apple Store. Surely one of them could show me how to fix something as simple as a lock. I made an appointment for the next day. On a Sunday afternoon the place was swarming with kids in red tee-shirts and handheld everything. The expert who waited on me said the fix should be easy, but she couldn’t get it to unlock. She took it behind that door where we are never permitted to go and I waited like the nervous relative outside the Emergency Room. A half hour later there was bad news and bad news. We can’t get it open, she said. A couple of other guys tried and they can’t get it to move. But there is an alternative. We can break into the compartment and see what’s wrong with the lock, and then replace the whole back panel. It’ll cost you $211. I left the store in a perplexed state. On the one hand, I was angry because the geniuses couldn’t fix a lock, and on the other hand I was delighted to know the geniuses were just as incompetent as I. It was a weird sort of parity but it made me feel good all the way home. If you’ve had the patience to read this far you deserve to know there really was a simple solution, or solutions, to the mysteries of my Sunday afternoon. I’m sure that what I did would be frowned upon. The problem with the tech at the Apple Store is that she saw only one problem and one solution. She could not make the lock to the battery compartment work properly and that’s where she stopped. What I could see was that the battery lock was turned to the open position and the lid on the compartment was barely ajar. I could just see a sliver of space between the cover and the case so I took the skinniest blade on my Leatherman and very gently pushed it into the crack between the compartment cover and the case, and pried a tiny bit; not enough to scratch or cut anything but just enough to see if the lid would move slightly. It did with practically no resistance and I was able to do the rest with my fingernails. Then I looked for some photos and videos online to see what I had done wrong in the HDD installation, and discovered I had inserted the drive upside down. I probably shouldn’t advertise that. But unlike some people, I never claimed to be a genius. Every video I looked at would leave out one or more crucial steps. One guy’s arm blocked everything he was referring to. I actually found the clue I needed in a still shot at this website. It clearly showed that the tab at the end of the hard drive was on the top when inserted in the bay, not on the bottom as some of the videos suggested. That was my “Aha!” momentito. I reoriented the drive, slipped it into place and, before putting the door back on the battery compartment, started the MacBook with my Snow Leopard DVD. Disk Utility promptly recognized the drive. I put the door back into place and used my flathead screw drive to more or less lock it. Nothing is falling out, in any case. In view of my interest in art and elegant solutions, I put the broken plastic cap over the broken lock and covered it with a piece of clear Scotch Tape. I think it looks beautiful in a retro sort of way.